Can You Buy Lac Hydrin Lotion Over The Counter? Lac Hydrin lotions and creams are considered to be the most effective treatment for dry skin conditions on the market today, not only exfoliating the skin and helping to hold in moisture, but also stopping that annoying and constant itching. If you are looking to purchase Lac Hydrin over the counter, there are some things you need to consider before doing so. Many people believe that you can only purchase Lac Hydrin by prescription. This is simply not the case. While Lac Hydrin 12 is sold only by prescription, there is a version of Lac Hydrin lotion that is sold over the counter. The version of Lac Hydrin lotion available without a prescription, which is called Lac Hydrin 5 Lotion, has a lower percentage of Lactic Acid than the prescription version. According to reviews, Lac Hydrin 5 is extremely effective in treating a number of different dry skin conditions. It has also proven to be very helpful in acne treatment as well as reducing fine lines and wrinkles. However, you need to keep in mind that because the percentage of Lactic acid in over the counter Lac Hydrin is less than half of the prescription strength, it does take longer to work than its prescription counterpart. This means it may take several months before you see a clear improvement of certain dry skin conditions. Can You Buy Any Product Containing 12% Lactic Acid over the Counter? People wanting the full benefit of 12% lactic acid to help improve their dry skin and keratosis Pilaris can buy a product called AmLactin 12 Lotion over the counter. However, according to various reviews, AmLactin 12% is not as effective as Lac Hydrin in treating either Keratosis Pilaris or other dry skin problems. This may be due to the difference in the various active ingredients that these two products contain. In order to achieve better results many users of AmLactin alternate this product with over the counter Lac Hydrin 5 lotions. It is difficult to understand why you can purchase AmLactin 12 without a prescription, but you need a prescription to buy Lac Hydrin 12. However, it is good to know that you can at least buy Lac Hydrin Lotion in an over the counter form. There are some benefits of the over the counter Lac Hydrin when compared to prescription strength. 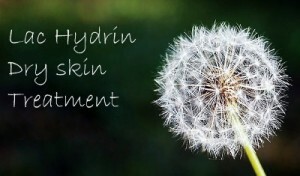 While both Lac Hydrin lotions are effective and help treat your dry skin problems, Lac Hydrin 5 is reportedly safe to use on your face whereas doctors don’t recommend using Lac Hydrin 12 on your face. In addition, while both OTC Lac Hydrin and prescription strength Lac Hydrin contain the same ingredients, you need to ensure that you do not have any allergies to these ingredients. There is also the possibility that the higher percentage of Lactic acid in the prescription strength lotion and creams may cause more irritation when applied to cracked dry areas of skin that are already irritated or broken open. People with sensitive skin may be better off using the milder over the counter form of Lac Hydrin. For the moment Amazon offers Geri-Hydrolac 5 lotion which is comparable to Lac Hydrin 5 lotion. Also, keep in mind that any treatment can cause side effects to some people. This means that those people may and do experience side effects from using over the counter Lac Hydrin. Normal side effects you may experience include stinging, dryness, itchiness and rash. If you suffer from a severe rash or stinging, stop using this product. As with any product, if you are taking any medications or herbal remedies, you should check with your doctor to see if Lac Hydrin is right for you. While it is not believed that this product will cause problems for people taking any internal medications, it is always better to be safe and sorry.